THE PROGRESSIVE Youth Alliance (PYA) may have acted improperly when they painted the tunnel connecting East and West Campus as part of their SRC electoral campaign. 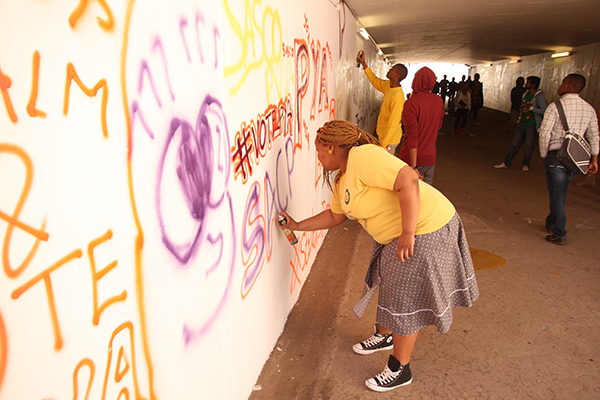 Abrahams said that the SRC and PYA have are only allowed to paint on the graffiti wall outside the Matrix “for freedom of expression purposes.” When told the tunnel had been painted with PYA slogans Abrahams said: “I will send someone immediately down to assess the situation. If that is the case, they will have to paint it over.” A representative from the PYA could not be reached for comment. The PYA is made up of youth organisations such as, the South African Students Congress, Young Communist League, the ANC Youth League (ANCYL) and Muslim Student Association. The tunnel was a canvas of vibrant, luminescent colours as members stood singing and spray painting the walls. “We are moving”, “Do Right!” and “Our Wits, Our PYA, Vote PYA”, were some of the things written in spray paint on the tunnel walls. The candidates, some wearing various ANCYL and PYA T-shirts busted into song and dance while students walked through the tunnel, viewing the spectacle.